Achill's magnificent landscape, big Atlantic skies and magical atmosphere have long provided inspiration for artists and writers. The Irish artist Paul Henry spent almost a decade on Achill (1910-1919) and his paintings of island life and the Achill landscape hang in the National Gallery of Ireland and in other prestigious collections. American artist Robert Henri spent several summers on Achill in the 1920s, staying at Corrymore House on the slopes of Croaghaun mountain. He painted hundreds of portraits of local children. The English novelist Graham Greene stayed regularly in a cottage in Dooagh, at the western end of Achill Island, in the late 1940s and early 1950s. 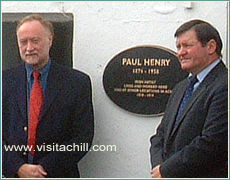 He is said to have completed the novel 'The Heart of the Matter' on Achill. In the late 1950s the German novelist Heinrich Boll first visited Achill with his family. He subsequently wrote a story of this first journey, titled 'An Irish Journey'. Published in 1957, this book offers a fascinating insight into life on Achill at the time. Boll returned to Achill for summer breaks during the 1960s and early 70s, staying at a cottage in Dugort in the north of the island. Other notable artists to have worked on Achill include Darrell Figgis, Derek Hill, Charles Lamb and Desmond Turner. The contemporary artist Camille Souter has lived and worked on Achill since the 1960s.